Kitten Herder recently pointed me to this Etsy listing for a set of highball glasses by designer Georges Briard, which takes the common bartender’s question a little more literally. I did a bit of looking, and apparently the original set also included a similarly-themed ice bucket. Briard’s designs sometimes can be found on eBay and other auction sites, and similar sets by other manufacturers (such as Cera) are also occasionally available. However, they tend to be fairly pricey–around $300US–and unless you’re setting up a retro-themed bar there’s no point in buying originals. Modern glasses with the same theme can be found on Etsy–these and these are nice–but it should also be possible to DIY a set using stencils and etching paste (or glass paint, for a more colorful look). 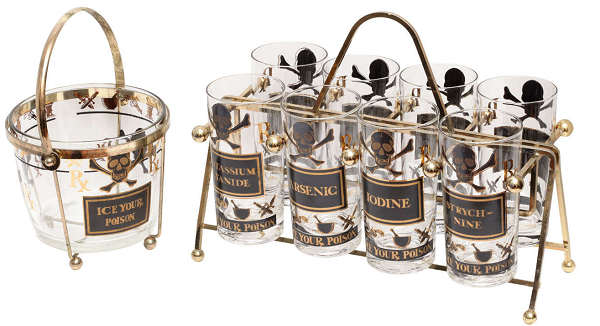 A set of glasses (and/or an ice bucket) would make an attractive gift, and who doesn’t need more skulls in their life?